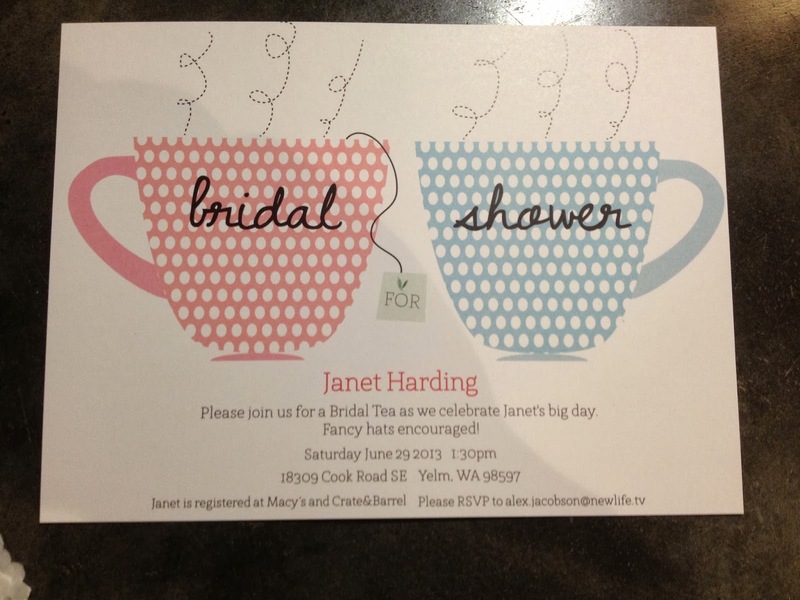 Again I found myself inspired by all the fun shower ideas I had seen on Pinterest and one of the other bridesmaids in this wedding found a “Bridal Tea” that we wanted to emulate. Plus a stole a few of my favorite “go to’s” that my party planning friends use. 😉 Mostly we chose the theme so we could all wear big hats. So fun! That bit of info was included in the incredible invitations my husband designed – “large hats encouraged.” I was so excited to get his invites and then to add my own finishing touches. 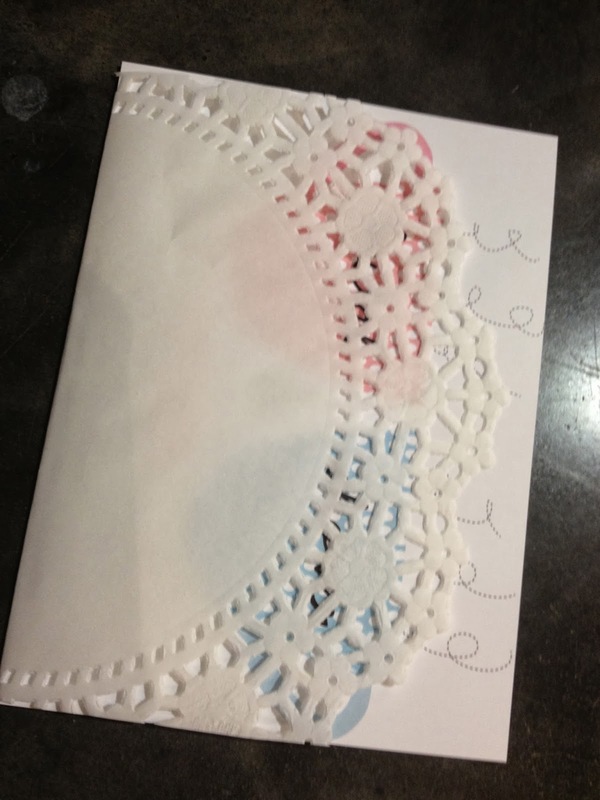 I wrapped each one in a trimmed doily and a small piece of white string. 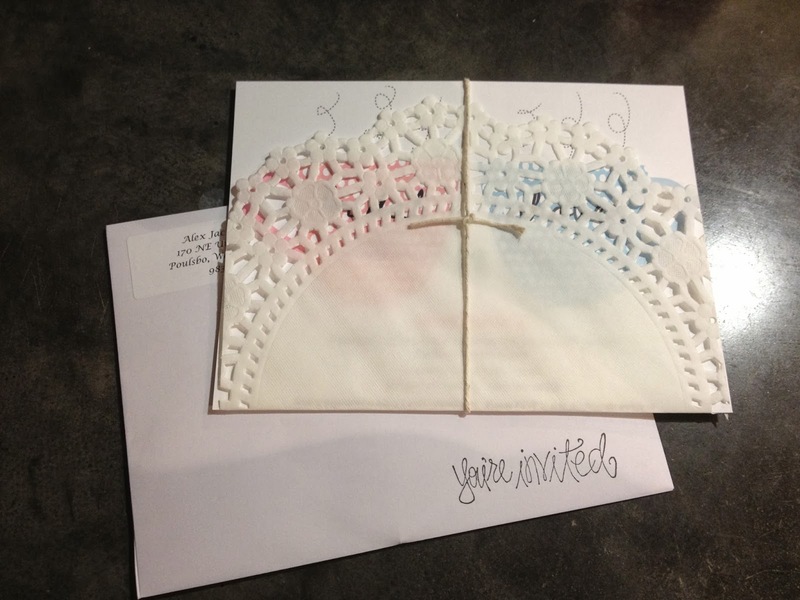 Then stamped “You’re Invited” on the front and a “They Lived Happily Ever After” stamp on the back of each envelope. It was the perfect finishing touch. Here is the bride (white hat) with her bridesmaids who hosted and worked together beautifully to host the shower. I have never been a part of a more cooperative and delightful bridal party. We pulled this shower together through a group Facebook message since we all live quite a ways away. And wanted to share the responsibility and joy of honoring our wonderful bride. The favor table included loose leaf tea we got from, honey sticks I bought in bulk from a co-op I am a part of and honey spoons made by the bride’s future sister in law – who couldn’t make the shower but wanted to contribute. She used photos we found online and this recipe to make her own. The tags read “Meant to bee together” and “Thanks for sticking by us.” The spoons were meant to be used in a cup of tea and tasted delicious. At one end of the gift table was a fun story “Pat the Husband” by Kate Nelligan that we had the bride read aloud. This was a really activity, especially since the bride is a first grade teacher and “Pat the Bunny” by Dorothy Kunhardt is an old favorite. 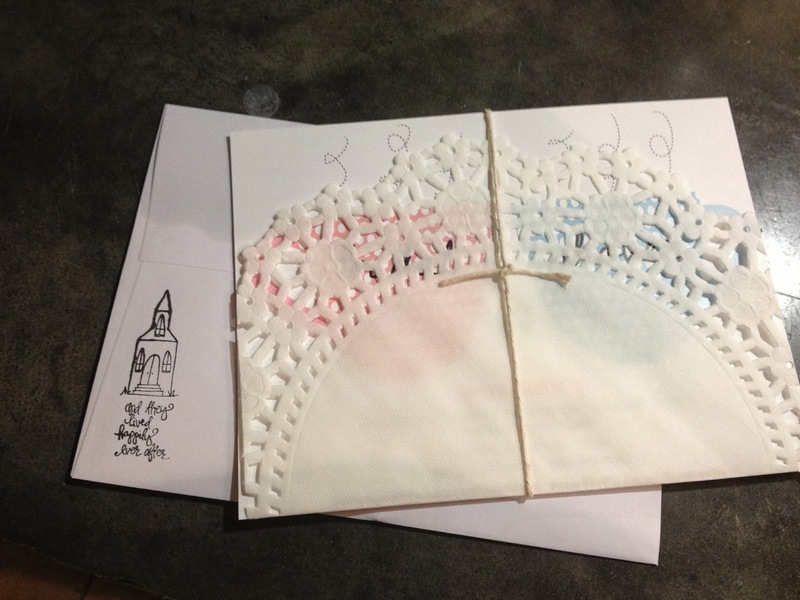 Plus the bride had handmade thank you notes and the envelopes were there for guest to write their addresses on. I used to be skeptical of doing this but having been a bride and a now a mother who had showers thrown to bless our family I am so grateful for the extra bit of help during a stressful periods when you still really want to express your gratitude. Also here at the table were fun pieces of scrapbook paper that guests could write date ideas on. These were put together on a notebook ring so Janet and her groom would have some fun ideas. There was a vintage hat table so that people could try on hats, pick one and feel festive during the tea. Centerpieces included old fashioned books, bouquets of flowers brought from three different cities that were displayed in tea pots and these adorable quotes about tea that one bridesmaid wrote on delicious brown paper (I love brown paper, burlap and all things twine!). She added touches of pink and yellow ribbon as those were our common colors. Again with all of us being from different places and not knowing exactly how it would all come together we tried to be flexible but share vision. Pale yellow paper straws and a tea set the bride’s grandmother gave her were used inside the house to make it more festive. We were blessed with an incredible location – a friend of the bride. And if I have learned anything having a great location can be THE key factor in party planning. Inside we had the food displayed which was wonderful because it was a hot and humid day! Gorgeous drink dispensers held water, lemonade based punch, and iced tea. 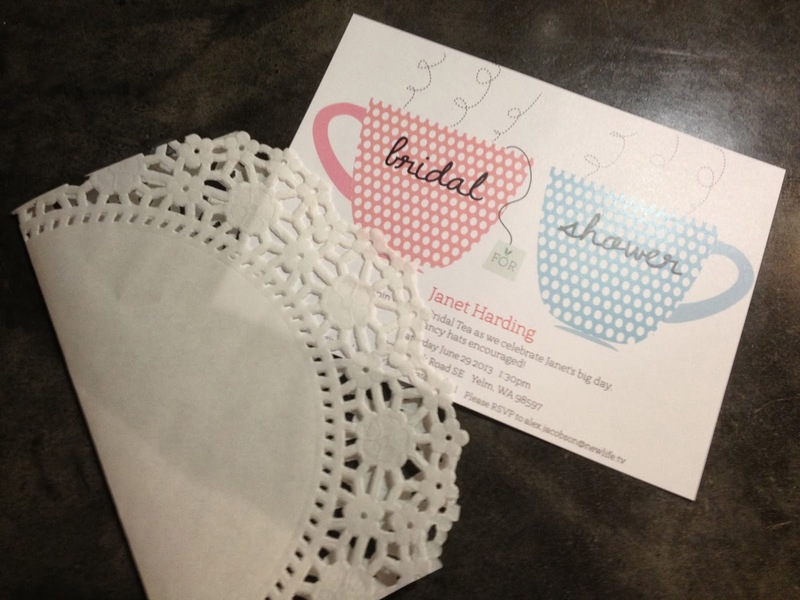 Outside were the tables that were covered in lace table cloths with teacups at each place setting. These were also favors for the guests to take home with them and they were topped with a few honey sticks too. We had a few picnic blankets out too – one of those “go to” party strategies I learned from a friend that I LOVE! Earl Gray and White Peony loose leaf tea the guests could serve up into festive plastic bags and take home with them. Again FOOD makes a party – at least in my humble opinion. I sent pins from Pinterest to various ladies and asked them all if they thought they could bring that item or something like it. I do this to help guide the party but also, like I mentioned before, to share the responsibility and honor of contributing to the party. One bridesmaid made these delicious tomato, basil, mozzarella skewers with balsamic vinegar drizzled on them. I love single serving items so it is easy to load up a plate! Lemon bars made by the brides future mother in law – DELICIOUS! Croissant sandwiches with turkey salad and egg salad, fruit skewers, and cream cheese and cucumber tea sandwiches. Tea party finger foods are easy, adorable, and so much fun. These fruit skewers were meant to resemble a rainbow and were a total hit – especially on such a hot day! Cupcakes on a tiered tower always look fancy and we used the yellow again in the cake toppers to keep the yellow and pink theme going. Scones – delicious, and a tea party must have. I think having tiered towers in your entertaining repertoire is crucial. I love mine (on the right in the picture) because they come a part and lay flat so they are easy to store). Mine is a discontinued Pampered Chef product. But they have a new one that has crystal plates that is equally beautiful. Cutting the sandwiches in heart shapes was a super fun touch. Showers are tough because often people forget to RSVP and it’s hard to know how many guests to plan for. This was very true this time around too. Although including an email for guests to RSVP to helped a lot. We just didn’t want any guest to not get a tea cup and really wanted to make sure there was enough food. My favorite game of the day was a list of facts that the Mother of the Groom and Mother of the Bride submitted to me ahead of time. I read one and guests either held up a mustache or an engagement ring on their left hand depending on if they thought it applied to the bride or groom. I love games that help get people to know each other or the bride and groom better. The other fun game took some planning and thought but was a lot of fun. We had a couple of prizes – again we tried to pick desirable and use able items. For this game the bride submitted a story to me of how the couple met, when they said, “I love you” and also about their engagement. I took the story and revamped it to include as many “rights,” “lefts,” and the names of the bride and groom in the story. Then guests stood in a circle and passed the prize to the right or left any time they hear the word in the story, or passed it across the circle when the bride or groom’s names were said. This was lively and created a lot of laughter, plus people learned a lot of fun details about the happy couple! Looking back on the party I am reminded of how incredible the location was. I encourage you to get creative. A friends home or yard, a park, your living room reinvented… Where can you host your next party? 1. 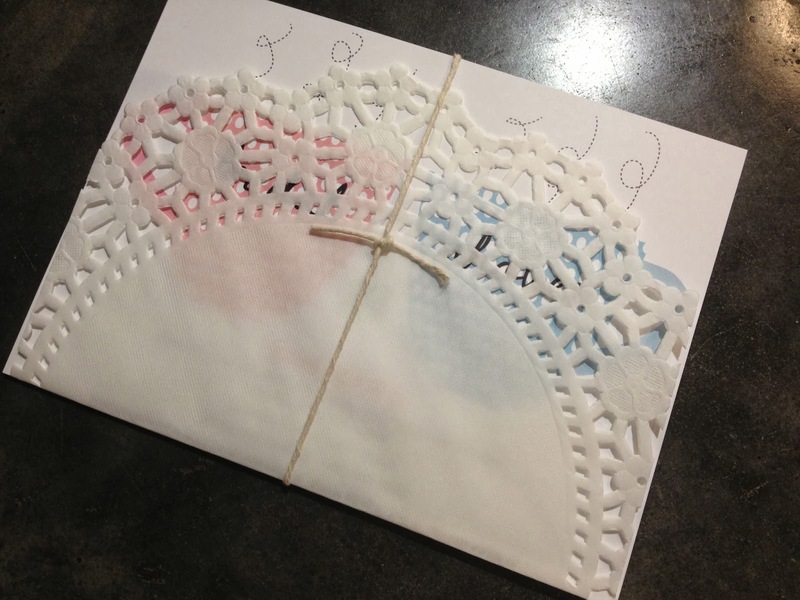 Your invitation sets the tone – think about details, and I think a paper invite is especially nice. 2. Include an email for people to RSVP to – in today’s e-world you are more likely to hear back. 3. Favors are your way to thank the guests for showering the bride (or mom-to-be) so be intentional. 4. Food is crucial so a variety and the right quantity is very important. This is an area not to scrip or cut. 5. Games that engage but are not too awkward are important. Think about games that help the guests get to know each other or the guest of honor. Most likely there reason you are having a shower is because a family is growing and people need to get to know each other. 6. Location is KEY and Decor can be simple and inexpensive – brown paper, twine, goodwill finds, reused blankets, reusable serving platters or tiered towers make the food display beautiful, etc. 7. Involve other people who also love the guest of honor to share the responsibility and honor of blessing their loved one. 8. Have a vision and communicate it to anyone helping. 9. Enjoy the party! If you are too stressed to enjoy then you’ve defeated the purpose of the party. Throwing a party is supposed to be fun and is a way to bless and say thanks. 10. Say thank you. Thank you to guests, other hostesses, contributors and anyone at the party deserves a thank you! Fun baby shower post found here.